We must consult our means rather than our wishes. The Donald’s cheerleaders, led by Larry Kudlow and Kevin Hassett, assure us we can grow our way out of the fiscal danger zone. They and their assumptions are as absurd as Stephen Moore and his candidacy for a seat on the Federal Reserve Board. It’s yet another aspect of Peak Trump: The Undrainable Swamp and the Fantasy of MAGA. Outside of the 2009 recession, the current U.S. revenue take of just 16.1% of gross domestic product (GDP) is the lowest in modern history. It’s below the 16.5 % collected during 1983-84, when I was working in the Reagan White House. That was before even the Gipper concluded that his original tax cut had gone too far. He then signed three bills to increase taxes. That raised raised the revenue take to 17% to 18% of GDP during the balance of his time in office. But here’s the thing. Reagan was at least willing to give lip service to shrinking the Welfare State – even as he poured billions into the Swamp on the Pentagon side of the Potomac. The Trumpified GOP proposes a tax burden lower than the Gipper’s lowest year. It also seeks to spend $4.8 trillion in fiscal 2020. That’s up $820 billion gain from the $3.98 trillion the Obama administration budgeted for fiscal 2017. That’s a 21% increase in just three years. And it makes a mockery of all Republicans who call themselves “fiscal conservatives” and who stoke fears of the tax-and-spend dangers posed by Democrats. Folks, we’re well on the way to insolvency without electing Bernie Sanders to the highest federal office or filling all of Congress with AOC-and-MMT-style socialists. The Gipper’s low-tide revenue years and big budget deficits occurred during the first years of a business cycle expansion, not the last. And they happened when the Baby Boomers flooding the labor force. Today, Boomers are clambering toward retirement. The difference between the macroeconomic and demographic conditions of the 1980s versus the 2020s are like morning and midnight. Not least is the stage of the business cycle. The Reagan Boom lasted 79 months. 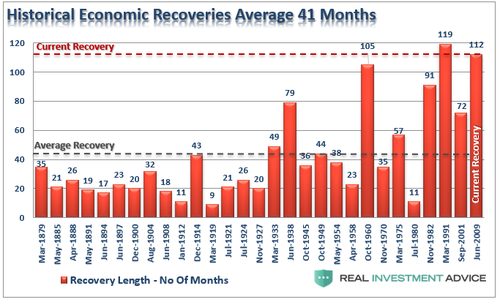 But the big deficits (relative to GDP at 5% to 6%) occurred in the first 24 months of the recovery. The Donald took office in month No. 90 of the current cycle. And he’s spent the last two years digging an ever deeper fiscal hole. Meanwhile, the odds that anything like the “Rosy Scenario” underlying the Trump administration’s 2020 budget will happen is somewhere between “slim” and “none.” It’s exactly this ridiculous: The president’s men assume the U.S. economy will go 243 months without a recession and that it will average 5.1% annual growth. Setting aside that dual fantasy, faux supply-siders of the Larry Kudlow-Kevin Hassett-Stephen Moore ilk are never able to reconcile a fundamental point. And in a giant retirement-driven Welfare State, the “real” versus inflation share of nominal GDP doesn’t much matter because entitlements are driven by demographics, not jobs. But any competent risk manager would assume the inevitable and account for at least one recession before 2029. That same competent risk manager might also assume an average rate of nominal GDP growth approximate to the actual rate for 2007 through 2017. It implies $6.5 trillion of lower revenue over the 10-year period. And, including other dubious Trump budget assumptions, it augurs more than $40 trillion of public debt by 2029. The U.S. economy can stand a lot of punishment. But $40 trillion of public debt in the face of the Baby Boom retirement tsunami is not among them.